A Nebelung cat belongs to the Russian Blue variety of cats with much longer hair. The name is German and translates to creature of the mist referring to the silvery-blue shimmery coat. Cora Cobb developed the Nebelung cat breed through the Nebelheim Cattery. The inspiration came from a kitten named Siegfried who was the litters only longhaired blue kitten. The mother was named Elsa and was a black domestic shorthair. The father was a black longhaired cat. The second litter produced Brunhilde, a female blue kitten with long hair. This pair were the start of the Nebelung cat breed and produced the first litter in 1986. By the end of the 1980’s longhaired Russian Blues were being imported from Eastern Europe to develop the breed. In 1987, the Nebelung cat received new breed status from the International Cat Association and were fully recognized in 1997. The Nebelung cat breed lives to 15 to 18 years of age and is considered a somewhat shy, quiet and gentle cat. The Nebelung cat loves to jump and climb to high places and study people at their leisure. Most of this cat’s attention is directed towards the family and they enjoy riding on a shoulder. The Nebelung cat is very loyal, sensitive, and can be hurt when the attention given is more than received. This can cause fearfulness and anxiety. The Nebelung cat breed enjoys attention but entertains themselves well if left alone for the workday. This breed is intelligent, active, graceful, and not destructive. The Nebelung cat will take offense if laughed at and knows their self-worth. This cat does not like change and thrives in a stable, quiet environment. Meals must be on time and faithfully served. 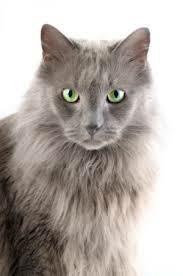 The Nebelung cat breed is healthy despite the genetic health problems common with cats of mixed breeds. The main concern with a Nebelung cat is a large appetite that can result in excess weight. 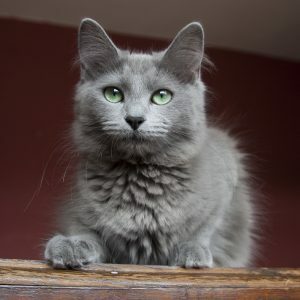 The Nebelung cat breed form a strong bond with their families that’s last for their entire life provided they are treated with respect and kindness. They are tolerant with children but care must be taken with small children who pet them too roughly. The Nebelung cat will accept all additional pets provided they are not menaced or chased. New pets such as dogs or puppies should be introduced gently and in a controlled atmosphere. A Nebelung cat has a long, thick coat of hair that requires combining twice each week. This will distribute the oils in the skin and remove any dead hair. The teeth should be brushed daily whenever possible to prevent periodontal disease. Nails should be trimmed approximately twice every month. It is important to wipe the corners of a Nebelung cat’s eyes with a damp, soft cloth so any discharge is removed. The ears should be checked weekly and cleaned with a damp, soft cloth moistened with a combination of warm water and cider vinegar when dirty. These cats are incredibly particular about their hygiene and the litter box should be spotlessly clean. A Nebelung cat is best kept as an indoor cat. A Nebelung resembles a Russian Blue with an incredibly thick shimmery coat. They are muscular with a wedge-shaped head. The ears are large with a wide base and pointed at the tips. The eyes are spaced wide with an oval shape and a deep green hue. The eye color is not fully developed until they are approximately two years of age. The neck is long and slender with a moderately shaped body. The Nebelung cat breed is athletic without any bulk, and the body is well proportioned with medium bones. The legs are medium-boned and long with rounded oval paws. The tail is thick, can be longer than the body, and has longer fur. The coat is luxurious and the color of the coat is a solid blue once the cat has reached maturity. The males have a neck ruff not prominent in the female. The hair increases in length as it travels from the shoulder to the tail. The fur behind the ears is a much lighter shade of blue and full maturity is not reached until the age of two.